Shine bright like a star in this fashionable and fun bracelet. Featuring glitter and glam the large star pendant is decked out in silver glitter sparkle. 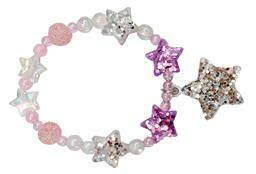 The 4 medium stars needed glitter too and let's not forget some of the beads featuring 2 large pink glitter beads. Make sure to check out the matching necklace for the whole star'd look!